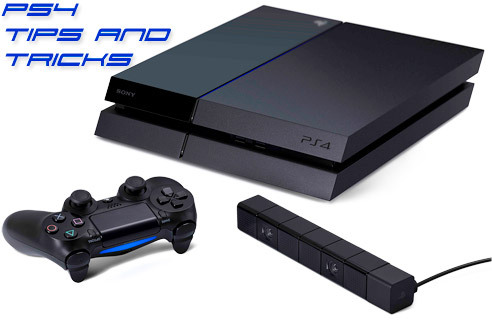 A collection of useful tips, tricks and hacks for your PS4. Updated monthly with contributions from our awesome PS4 fans around the world. You can use a DualShock 4 on your PC or Mac, but you'll need to connect it with a USB Cable. All you need is the latest update on your PS4, and you'll be able to download the remote play software to your computer From This Page. You can now share moments from your friend's feeds on your own and share in the gloating. The ability to tag other players in photos and carry that over to Facebook has also been added. Remember, pics or it didn't happen. Members can now use a hub to view and manage their online storage with ease. You'll also have the ability to see which of the PS+ free games your friends are playing. "Housecleaning in the Latest Update"
You can disable the screenshot notification so it doesn't photobomb you. You can search more detailed queries on Live From PlayStation and choose from multiple types of content (video, screenshots, pre-recorded). The system can support up to 4TB of external storage with the Nyko Databank now. As part of the new 3.50 system update, you can appear offline if you'd rather not be bothered while trying to watch a movie or marathon the new Witcher 3 Expansion. Simply go to your profile on the main menu, select it, and then select "Online status" to change how you appear publicly. Another new feature allows you to receive notifications when specific friends jump online. Simply select them on your friends list and then press "options." You'll see the option to "Notify When Online" so click that and you're good to go. So, from the beginning, you've been able to set up parties on PS4, but now you can make a whole event out of it! On the menu, go to the "Events" tab and choose to "create an event." You can choose the day, time, and game you want to play, pull together a list of friends you want to play it with, and then presto, invitation go out! When the time comes, those players will be automatically added to a party with you! Events can also be shared to communities that you're a member of. Members can register for the event on the community wall. This feature allows all the members of a party to see what the others are playing. From here you can join a friend's game or start one for the group. A small feature, but a cool one nonetheless. The DualShock 4 only requires a Micro USB cable to charge. That means you can use your cell phone charger or the cable that attaches to it if you're in a bind. You can even plug the controller into your computer if you need to charge while you're working (like me). If you have a phone charger with a USB plug, you can also plug your PS4 charge cable into the brick and you can charge it with a wall plug. Now you won't have to worry about dead controllers again. By default, the DualShock 4 doesn't automatically shut off. This is killer on your battery, so head into settings > power save settings > Turn off DualShock 4 Automatically to set when it shuts off. "Just Gotta Take a Break"
If you're about to rage quit, but you can't remember when you last saved, don't sweat it. You can leave a game suspended and return to the menu to watch an episode of your favorite show on Netflix. Once you've cooled down, you can return to the game without having to reboot it. You know when you put in a disc to install, it just shows a bar, not how much is left to install? Drives you nuts doesn't it? Well, if you head into your settings > System Storage Management > Applications and choose the game, you'll be able to see exactly how much time is left. "I Need this Video, Now"
Regardless of your current Share button settings, if things are going down in your game and you need a fresh recording to prove it happened, then double tap the share button to start a new recording. You can set your PS4 as your primary system by going to settings > PSN > Activate as Your Primary PS4. Doing this will allow any other accounts (up to 16) to play online if you have PlayStation Plus. You don't even have to be signed in! This same process can be used to disable it as your primary system if you need to bring down the banhammer. As mentioned previously, the 3.00 firmware updated added stickers to be used in messages. The 3.10 update added new stickers based on The Last of Us, God of War, Hohokum, Fat Princess Adventures, and Journey. As of October's 3.10 firmware update, you can follow the verified accounts of game studios and developers. This works, even if you're not friends with them, which is sweet. Ever wonder what Shuhei Yoshida, one of Sony's top executives, is playing at three in the morning? Now you can know! When you're trying to type a message or the code from a PSN card, don't waste time shifting from letter to letter. Instead, click the R3 to use the gyro typing mode. Simply tilt the controller to move the reticle and blast those letters like you're playing Typing of the Dead. Bonus points if you know what that game is. "Videos Can be Streamed to YouTube, and Uploaded to Twitter"
As part of the new updates, PS4 users can now share video clips to Twitter with a new icon on the system's Video Clip menu. This brings the total count of potential sites for sharing videos to 3. The other two of course are YouTube and Facebook. In addition to this new video upload option, YouTube Live is also supported, allowing you to broadcast live gameplay to the platform, in addition to Twitch. This is also huge for anyone looking to get into the streaming scene. "PlayStation Plus has a Home Now"
Normally you have to meander through the PlayStation Store to find the latest PS+ deals and free titles, but not anymore! As of the 3.00 update and beyond, you can find an actual PlayStation Plus section complete with the month's free titles, member discounts, and all of your current redeemed games in one, convenient place. "Message and Group Chat Improvements"
Recent updates have brought welcome changes for those who utilize group chats often. Now, when you start a group, or you enter one, you can see the online status of everyone within and what they're playing. On top of this, you can also create favorite groups. This way you can quickly access the group you typically play games with based on each game. Rounding out the feature list with the latest update is the addition of communities and stickers. Communities allow you to join up with like-minded gamers based on game, genre, and other interests. These groups even have a message board, screenshot gallery, and the option to join in other groups and parties. Lastly we've got stickers now. These are essentially little images you can send with your messages. They are taken from popular games like Uncharted, Knack, Little Big Planet, Resogun, and more. "Sharing is Caring (Unless You're Kermit)"
There's a little-known feature on PS4 called Share Play. It allows you to share screens with someone for 60 minutes at a time and even allow them to control the game if you're having trouble. They don't need to own the game, but they can still interact with it and play with you in local multiplayer. All you have to do is press the "share" button, and select it to start. From there, invite one of your friends and you're good to go. Just be careful who you hand control over to. You don't want to end up like that person who played with someone named Kermit on Destiny. Apparently Kermit deleted all of his level 30 characters while he had control. Youch! "You Can Vote on Free PS+ Games!" Just in case you didn't hear about it, PlayStation is doing something new for PlayStation Plus members. You can vote each month on which game you want to be free from a list of several options. When the polls open, if you're a member, head into the store on your console and navigate to the "Vote to Play" screen where you can cast your vote! "Easy Disc Reading Error Fix"
Some people have been having issues with their PS4 reading discs if you boot it from safe mode or use the eject button to take the disc out. This issue is fixed when you restart the system and is the result of a problem in the last system update. Relax, your PS4 isn't dying. To stop this from happening, refrain from using stand-by mode, and eject your discs by selecting them on the home menu with the "options" button and pressing "remove disc." "You're Going to Need That Camera Eventually"
Have you heard about the virtual reality headset Sony is working on? It's called Project Morpheus, and when it comes out, you'll need to have the PlayStation Camera to use it! It's going to track the motions of your head using the camera, so, if you have one collecting dust, don't worry, it will be very useful soon. Lucky you, you don't have to hunt one down when that time comes! If you're strapped for cash, here's another valuable tip for all of the early adopters of the PlayStation Camera: you can use it as a microphone for online chat. Yep, it's got one heck of a pickup on it though, so don't feel like you have to talk louder than usual, and if you have something you don't want everyone and their grandmother to hear, discuss it in a different room. Seriously, it will pick up anything. "Free Stuff For Your Camera! One of our users was asking about tips for the PS4 camera. Here's one: there's a free augmented reality game that uses it! It's all The Playroom and while it won't keep you as busy as The Witcher 3: Wild Hunt, it's totally free and it has a few extra DLCs for it that are also free. It will give you a reason to use your camera at the very least. If you're worried that your PS4 isn't getting the airflow it needs, a cheap cooler for a notebook or laptop can work if it's USB. If you grab one with extra USB ports, then you're just the best, and you have more USB ports than anyone else. Tip: "Right Where I Left Off!" With the latest update, the PS4 can suspend games by just pressin the PS button in the center of the controller. You can put the system in rest mode and come back whenever you want to pick up where you left off! Did you know you can back up your hard drive data onto an external device? Yep, everything from saved data, to video clips, to settings and screenshots. All of it can be pulled onto an external device or vice versa. Tip: "Request All The Friends!" When you link your PlayStation account to your Facebook, you can use a feature called "Friend Finder" to search out people on your friend list that also have a PS4. Instant connection, alright! Tip: "No Trophies? No Problem?" There are some new features you may not know about. For example, you can delete games from your trophy list if you have 0% of the trophies in that game. Trim the fat so only the best stuff is showing. Tip: "Proof of Your Power!" The PS4 automatically takes screenshots of the moments when you earn trophies. This allows you to have proof behind those platinum trophies you've been earning! Tip: "Down Light Bar, Down!" The light bar on the DualShock 4 is a cool feature to be sure, but it can also been intrusive when you're watching Netflix or a movie on your system. Luckily, you can at least dim the light significantly, and it's quite easy to do. Head to settings > Devices > Controllers >Brightness of DualShock 4 Light Bar to choose your setting. Tip: "What Did That Update Do?" Many PS4 games actually have patch notes included with each update. That way you can feel good about waiting that three hours for the update to finish since you found out it actually fixed a game breaking glitch. Tip: "No More Notifications, Yes!" Hey, you know when anyone on your friends list does ANYTHING, you get this little pop-up notification? It drives me nuts, how about you? Let's get those to go away, shall we? Go to Settings > Notifications to disable the pop-ups you don't want to see. Like when your friend joins a party, I think I'll set that one on fire. Tip: "Is it a USB Device? It'll Probably Work"
I know you're eyeing that Astro headset, and trust me, I understand completely. In the meantime though, just about anything with a USB connection will work on your PS4. Anything from a random USB headset, to a mouse, keyboard, or even free standing recording microphone! People love to send horrific messages online. Don't ask me why because my answer will probably contain words that will get me fired from PS4 Experts. If you're tired of the constant messages from haters attacking your very character for beating them in Call of Duty, you can stop anyone you don't know from sending messages. Go to Profile > Privacy Settings and make adjustments accordingly. You can also change what your friends see on your profile. That way you can sneak a little Barbie Island Adventure without anyone being the wiser. Tip: "A Useful Feature, OR a Great Prank!" So, if you go to Settings > Accessibility > Button Assignments you can change the function of each button on the controller to tweak it to your liking if certain games won't let you do it within their menus, or if you just have a preferred layout. I don't condone this, but if you wanted to, say, completely mess with someone's head, you could go in here and change everything around. Make sure you film it and upload the footage to YouTube. Step three: profit. Tip: "Making the Share Button Work For You!" There are default settings that dictate how the share button works, but you can also customize it to take a screenshot, or begin recording without ever entering another menu. To do so press the share button, then the options button on your controller. You should see a "Share Settings" option, which will allow you to dictate how the system handles you pressing the share button. For example, a quick tap can take a screenshot if you'd prefer! Tip: "I'm Here all the Time, Just Log Me in!" If you were to ask me what my PSN password is, I would probably just stare at you and drool. For people who have too many passwords (#GamerProblems) you can go to Settings > Users > Login Settings to enable the system to automatically log you in when you boot it up. If you double-tap the PlayStation button on your controller you can immediately switch back to the last app you were using. This is a great way to jump between things like Netflix and the web browser. It saves you from having to scroll through the menu icons when you want to switch. I say not verified on this one because GameStop tends to change their trade-in values more than my girlfriend changes her clothes before a date (don't tell her I said that). As of right now, the word on the street is that GameStop will give you $100 for your Xbox One towards a PS4. Let's be honest, that's not bad considering what it's really worth. Got 'em! If you're like me, you get bored sometimes and you just say "hey, I'll just open the PSN store and check things out. You figure it will be quick and easy, but what if it's not? Is your PS4 going to die?! No, actually you can fix long loading times in the store by exiting some of the apps you currently have running. Think of the PS4 like a computer, the less programs you're running at once, the faster it can get things done. If you still have any issues, a restart will level the playing field for you. If your PS4 sounds noisy, or if you're experiencing overheating issues, there's an easy way to fix it without spending too much money. You can use a variety of items on the four corners of the system to elevate it for better airflow. Some users suggested erasers, bottle caps, or in another case I read that felt pads would work as well. One user also suggested purchasing a cheap computer cooler that runs on USB. This is another good suggestion if you need to cool multiple systems, or if you'd like a more "official" method of solving the issue. Some people have experienced issues where the system constantly ejects the disc. A couple readers provided some solutions for those who are experiencing this problem. For starters, you can use something like erasers or bottle caps to raise the system under each corner which works for some people. For others, the solution is simply to power down the system by holding the power button until it beeps twice. Then you wait until all the lights are off and unplug the power cable for three minutes. Once you start it back up, the problem should be fixed. While it's most certainly something many people know, not everyone may be aware that you can in fact upgrade your PS4's hard drive if you're running out of space. The occasional reminder for this feature is always a good thing, and Sony totally supports it. For a full guide on how to get it done, check out our PS4 Hard Drive Guide. If you haven't downloaded the PlayStation App for your smartphone, what are you, some sort of caveman/cavewoman? Seriously! This app does a lot of awesome things for you, including giving you the ability to purchase or redeem downloads remotely and have them ready to download or install when you get home depending on whether or not the PS4 is on standby. Either way, if you remember you need to redeem your PS+ freebies and you don't want to forget, queue them up on your phone on the go! Who wants to choose between their headset and the PlayStation Camera? Not me, and you don't have to either. As long as the camera is plugged in, you can use your headset like normal and adjust audio output/input through the settings. Even if the sound is going in and out of your headset, the PS4 will still pick up your voice commands through the camera, provided it's plugged in. Talk about having your cake and eating it, am I right? Of course I am. Instead of playing the popular free-to-play War Thunder game with a controller, plug in a mouse and keyboard to the USB ports for better aiming and control. Left Shift and CTRL speed up and slow down the plane respectively. "G" controls the landing gear, "F" controls the flaps, and "L" leaves a smoke trail. Is your significant other tired of you staying up playing games all night and making noise? Without needing to rush out and buy a gaming headset, you can plug a pair of headphones in to your controller instead. From here, go to settings > devices > controllers and change the audio setting to "all audio" to funnel all that sweet gaming goodness into your headphones for personal audio bliss. Need to know when your PS Plus subscription is running out? Press the PlayStation button while playing a game you got for free and select "Time Left" to see how much time you have before it needs to be renewed. Since Sony hasn't made a media remote just yet, there's a nice work around that can be used. If you own a television that supports a feature called HDMI-CEC, you can enable this on the television's settings. This will allow you to use your TV remote and transmit those actions to the PS4 via HDMI. In essence, you can pause/play your movies and shows with the same remote you've always used! If you have a smartphone, download the PlayStation app for a variety of new features. One useful tip is to use the app for messaging your friends on the PSN. It's easier to type on your phone than on the TV screen. Do you have a good tip to share with your fellow gamers? Add a comment below!